This photo provided by the Kentucky State Police shows Officer Phillip Meacham. 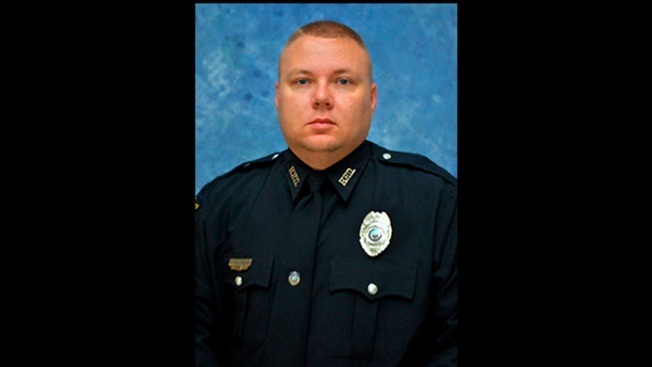 The off-duty police officer was shot and killed Thursday, March 29, 2018, in Hopkinsville, Ky., and authorities were searching for a suspect who fled in a stolen truck, Kentucky State Police said. A man suspected of fatally shooting an off-duty police officer in a small Kentucky city was killed by law enforcement officials in Tennessee, authorities said Friday. James K. Decoursey, 34, of Hopkinsville, Kentucky, "had a brief encounter with law enforcement" officials in Clarksville, Tennessee, where he "was shot and died from his injuries," Thursday evening, Kentucky State Police Trooper Rob Austin said in a statement. Authorities haven't described Decoursey's motive for shooting the officer, but Hopkinsville Police Chief Clayton said DeCoursey had a prior arrest record, was known to police, and that while he wasn't positive the two men knew each other personally, "considering they're both from here, it's very likely." Kentucky State Police said Decoursey fatally shot 38-year-old Hopkinsville officer Phillip Meacham Thursday afternoon, then fled on foot and drove away in a pickup truck. The details about his final encounter with law enforcement in Tennessee weren't immediately released. Austin said the Tennessee Bureau of Investigation is investigating. Police said Decoursey was impersonating an officer when he pulled Meacham over, NBC affiliate WSMV reported. Meacham, married and with two school-age children, had been with the Hopkinsville department since last May after working for about 14 years with the Christian County Sheriff's Department, Austin said. Sumner said he spoke briefly to the slain officer's widow while the suspect was at large, telling her two things: "We will find him," and "I'm sorry." Gov. Matt Bevin announced the officer's death on Twitter. In Frankfort, lawmakers in the House stood for a moment of silence after Rep. Walker Wood Thomas of Hopkinsville announced that an officer had been shot. Hopkinsville is about 73 miles (117 kilometers) northwest of Nashville, Tennessee.